Last week i made myself a watercolor sketchbook and it’s the perfect occasion to show you my watercolor sketchbooks ! I’m painting in my sketchbook mostly to keep memory of places where i went or object i find interesting. And sometimes, i use them to test another style, effects, colors… So i’m looking for the perfect sketchbook. Two characteristics are important to me : the shape and the paper quality. I want a sketchbook that will fit in my backpack easily and i need a paper very similar to what i use mostly. And this two points are quite difficult to find ! I’ve started to sketch with watercolor in march 2016 with a Moleskine sketchbook. It is perfect for sketching with a pen and ink and then coloring it with watercolor. But some effects like wet in wet and blending colors are quite difficult to get. And i can’t layer too much colors, because the pigment from the last layer can be reactivated each time i use my brush on it. It’s a very sturdy sketchbook and the shape is just right for my bag. My second sketchbook is a hand made one which i made during the summer of 2016. And it’s not finished yet… Mostly because i do not like the paper. The paper is made by St Cuthberts Mills in the Bockingford range. It’s a cellulose paper and it behaves oddly for my taste compare to a 100% coton paper. The paper dries very quickly, and it can blooms very easily. It was my first hand made sketchbook so it is definitely not perfect but it’s still in one piece after two years ! My third sketchbook is very similar to the Moleskine one. It is from the brand HandBook Journal Co and it’s the Travelogue. I love the cover covered with fabric. It does not impact the quality of the sketchbook but it’s a nice feature. This skecthbook is also very sturdy. The paper is a bit better than the Moleskine. If i have to buy a sketchbook for improving my drawing with watercolor i would choose this one. But it can be hard to find sadly. And now my before last sketchbook and the one i use now : a Khadi Paper sketchbook. This sketchbook is made with a paper made in India. It’s 100% cotton and it’s the best paper i have in all my watercolor sketchbooks. I can paint with the same style as i paint on watercolor paper and i can get the same effects. One thing, it can be hard to get fine lines sometimes as the pigments can diffuse a little bit into the paper. The biggest problem i have with this one is the size. It is too big of just 1 cm to fit perfectly in my backpack… So it stays at home often and i use it to test new idea. As i wanted a sketchbook easy to take with me everywhere without costing too much (the sketchbooks before are in the 15-25€ range), i decided ti try again to make my own sketchbook with the paper i choose. For around 10€, i can get a 30 pages sketchbook with a 100% cotton paper ! Of course you need to have some time to make it. I followed the tutorials by Sealemon to sew the pages and make the cover you can find them here. The paper i used is from St Cuthbert Mills again but in the Saunders Waterford range. I didn’t test it for now, but it should be great ! I choose a weight a bit lighter from what i use usualy : 190g/m2. With this type of paper the pages can be fold without cracking the fibers. But i will need to pay attention at the amount of water i use because it will buckled way quicker ! I’ve used an entire sheet (56×76 cm) cut in 8 (32 pages). And i have kept all the rough edges of the sheet ! It makes it look a bit perfectly imperfect this way. I will come back to tell you what i think of this new sketchbook as soon as i’ll use it ! And you, what are your favorite watercolor sketchbook ? What colors in my palette ? Each watercolor manufacturer has dozens and dozens of colors each more appealing than the others. So how to find and build your ideal palette ? We often say that everyone taste is different ! That’s also true for watercolors. Choosing a particular color is very personal. It can be based on facts : transparency, lightfastness or the quantity of pigment in it… But it can also be based on feeling. For example, i don’t have any cadmium pigment in my palette because they are too opaque for my taste. And i don’t planned to add orange in my palette because i don’t like that color. But i could add tons and tons of blues and purples because i love them so much ! When starting in the watercolor world it’s even more difficult to choose a color. You don’t know for now what you like or dislike. But step by step, you will find your taste and you’ll be able to choose a good color for your liking. Some brands offer dots card and it’s the perfect way to test some colors before buying. Study quality or extra-fine ? There is here no bad choices. It totally depends of what you would like to achieve. The principale differences between study or extra-fine quality are : the density of pigments, the binder sometimes, the lightfastness (the capacity of one color to resist to the light) and of course the price. If painting is just a hobby, a way to relax and disconnect from work, the stury quality can be juste what you need. On the other hand, if you want to expose your work and deepen your practice, the artist or extra-fine quality is for you. My ideal palette would content : a warm blue, a cold blue, a warm red, a cold red, a warm yellow, a cold yellow, one or two earth colors and a neutral color. With this set of colors you can create so much mixes. To have the cold and the warm variation for the primary colors (blue, red, yellow) allows you to have a deepest range of colors. So what’s going on my palette at the moment ? I don’t have exactly that set but i’m very close to (and you’re free to adapt this set for your liking). For the blues, i have ultramarine blue (warm) and manganese blue (cold). The reds are winsor red (warm) and permanent alizarine crimson (cool, but i would like to replace it by something like quinacridone pink). And for the yellow i have winsor yellow deep (warm) and verona gold ochre (which is an earth color). I don’t have any cold yellow because i don’t need it so much in my style of painting. And for the complementary colors i have burnt sienna and neutral tint. With this set of colors i can have a lot of mixes and possibility. But it’s often more convenient to have some other colors which will help you with mixes you would have made all the time. They are here to ease your life ! This colors are even more personal ! Because they are a reflection of your style of painting and of your favorite subject. In my case, i like to have green gold (thanks to this colors i can avoid to have a cold yellow in my palette), viridian, carbazole violet, lavander, cobalt blue and payn’s grey. And finally, there is some very peculiar colors, mixes of certain pigments that are my favorite. They are special because of the way they behave on paper. They can granulate a lot for example or contain some shimmer or they can also break apart and reveal the different pigments in it. I have only two colors of that kind : bloodstone genuine and moonglow (from Daniel Smith). My vision of the ideal palette presented here is going to change and follow my taste and needs. No matter the quantity of colors we own, the creativity and what we do with it is the only thing that matters ! And you ? do you have some favorite colors ? After presenting my actual palette, the next step is of course talking about brushes. So, i own a lot (too much). They have been accumulated over time and discoveries. Here you have some of them, my most favorite and used ones. For a long time, I was using almost just the Escoda Versatil brushes. They are so good ! they contain a lot of water, the fibers have just enough spring to stay in a perfect shape all the time but they can also make very free and lively brush strokes. The brush are flexible enough to bend as you want on the paper, but as soon as all pressure is removed it goes back into his initial shape. But since a couple of month, i use more and more natural hair brushes, like the Escoda Aquario. The capacity of retaining water of those brushes is unbelievable and it becomes easy to paint big washes. The hair are very very flexible and they can be deformed easily. This brushes are very sensitive to pressure. They can be used for flat washes as well as for details. And they are perfect for organic brush strokes. Natural hair brushes can be quite expensive, but there is synthetic imitation which are less expensive and almost as good as natural hair, like the Escoda Último brushes. Their fibers are as flexible as natural hair and they can hold also a lot of water. I own those two brushes for not so long time so i can’t tell about the durability of this kind of brushes. yes, i have a lot of brushes, but i also have a lot of different shapes. I’m convinced that one brush can be enough (a wash brush like the Raphaël 803 for example), other brushes in different shapes can make painting easier. Flat brushes are very useful for landscape with a distant background. They can create a mountain or a forest in a few brush strokes. When the side is used, they can make very fine line and when the flat part is used they make beautiful big flat washes. The riggers, as they are very flexible, are best for creating lines and curves, perfect for organic shapes. But the essential part is to know your brushes and try them in different situations. This way you will learn what you love about them. Because what’s working for me isn’t maybe what will works for you. That’s part of the reason why i have so many brushes : with time i’ve learned what i like about my brushes and also what i didn’t like. And now i’m more able to choose a new brush efficiently. There is lots more tools than brushes that can be used for painting ! The list depend of your imagination ! So here you have a selection of tools that can be useful when i paint. Sponges, foam, nib, tooth brush, spray bottle, gaze, fabrics… Lot’s of everyday object can be used to create effects and textures. I’ll certainly make a video with some of this tools ! And you, what’s your favorite brush/tool to paint with ? I bought my first watercolor palette about 15 years ago… Since then i kept buying (or receiving them as gift) from time to time. Now i have 6 palettes, which is way too much for just one artiste ! It’s too much but at the same time each palette has it’s purpose. And today, i’ll present you my last palette i’ve bought and the one i’m using almost all the time now : my Mijello palette. 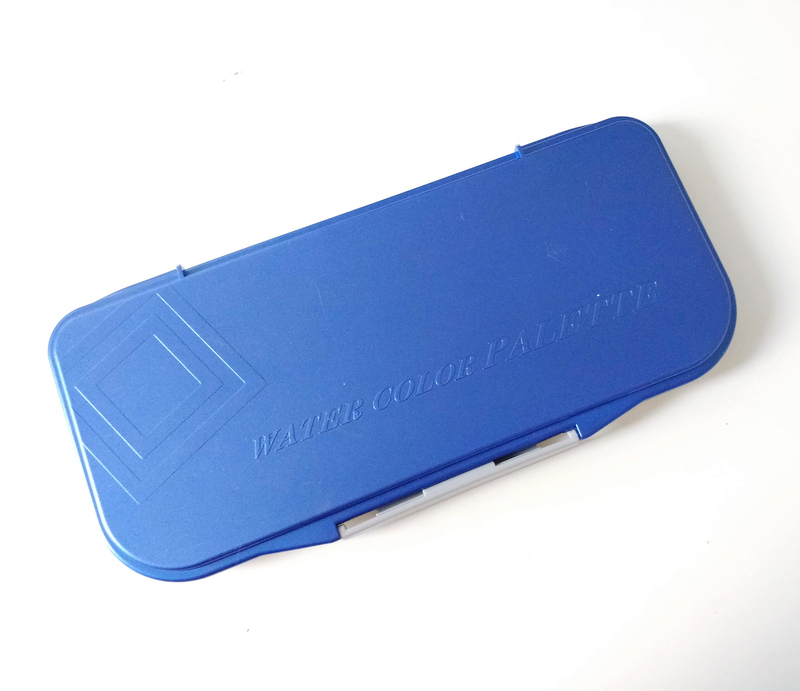 It’s a plastic palette and seems to be very basic, but in fact it is well-thought. With 18 holes for colors, it’s more than enough to get a nice choice of colors. The Mijello palette has also two big mixing areas on the same side as the colors and two even bigger areas in the lid (the lid contains a removable tray so the surface is doubled). The color holes are big enough to fit my biggest brushes and therefore are easy to use. 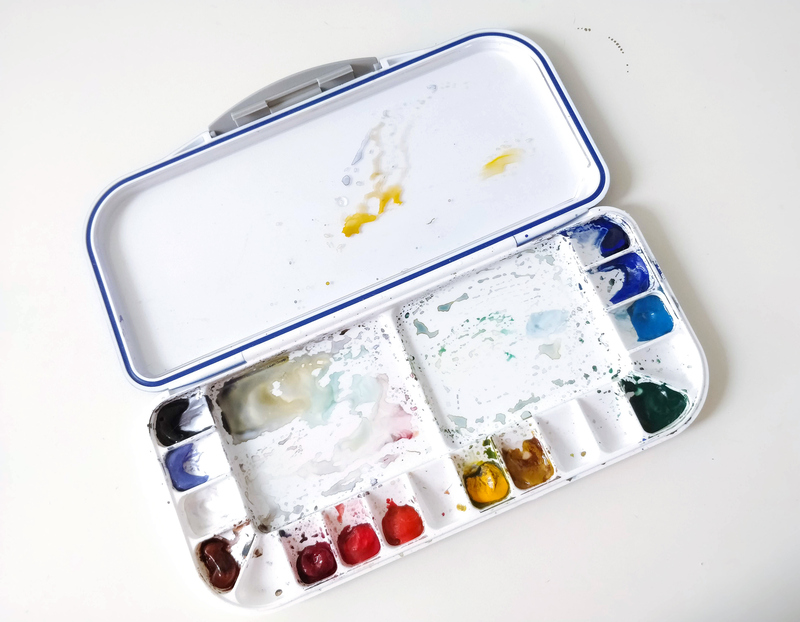 The biggest plus in this palette is the the entire lid has a joint which seals the palette once closed. So that the colors won’t dry (or at least not as fast) in the closed palette. It’s a very interesting feature for those who paint regularly : the paint stays at the right consistency every time. The plastic of this Mijello palette has been worked to offer the best mixing area possible. The water lies on the top of it nicely in order to have a good sens of the color and consistency. Usually on plastic surface, water can lay a bit funny, like if it doesn’t want to leave the brush. Here it’s not the case : it’s quite the same result as enamelled metal palette. The only negative point i can see with this palette is the inability to change the colors easily. I’m used to change the colors in my palettes quickly thanks to pans. But here the colors lays directly in the palette and if i want to change one i have to used it first ! You can see on the picture that my palette is quite dirty. I’ve choose to not clean it. What’s left from a previous painting, will be used in the next one. This way i can break my colors easily (break : not using the color straight from the tube) and get some interesting colors. It’s weird at first, i had to force myself not to clean it. But with some time, i got it and it’s very practical. Greys are even easier to mix !